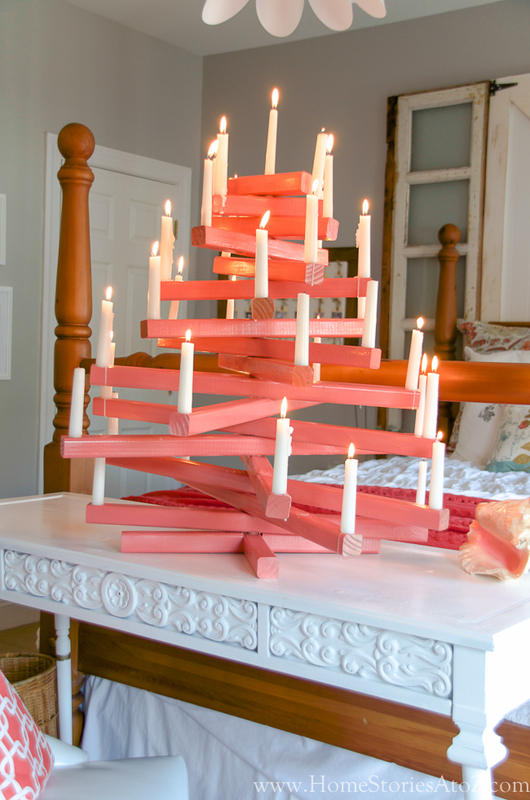 Learn how to build a DIY Modern Candle Christmas Tree out of wood using just a few supplies from a home improvement store such as Lowe’s. This easy tutorial for beginners takes you step-by-step through the building process. Last week, I met up with my fellow Lowe’s Creative Ideas bloggers at Lowe’s Headquarters and had the opportunity to tour the campus and meet with the inspiring folks at Lowe’s. I came home filled with ideas and ready to build something! 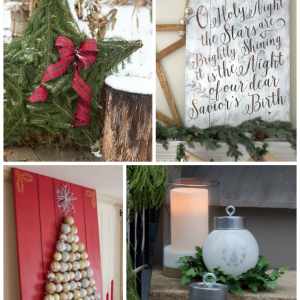 This month’s Lowes Creative Ideas challenge was to refresh the home for holiday guests. 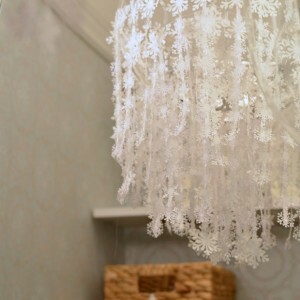 Our guest room doesn’t typically get much love during the holidays. I knew that this year I wanted to add a Christmas tree to the room but was having difficulty finding coral-colored ornaments. 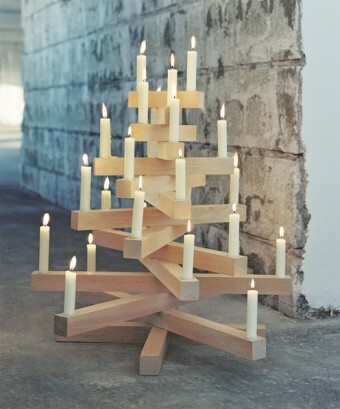 After giving it some thought, I decided it would be fun to create a modern, wooden candle holder tree and googled the idea to see if it had been done before. Sure enough it had been done before! 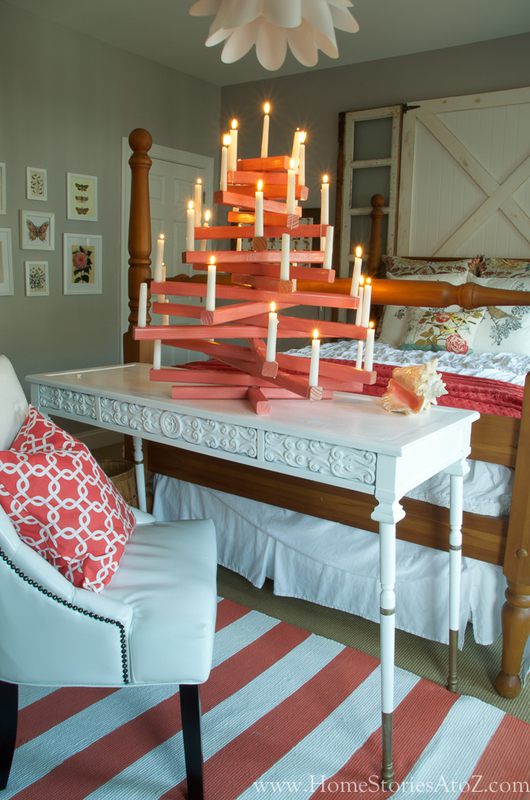 The tree pictured below is by Sandra Lindner and was my inspiration for the project. She didn’t have any plans for how she created her tree, so I had to mostly wing it. I also found similar plans on The Design Confidential. While I didn’t end up following Rayan’s plans, if you choose to do this project you might find her tutorial helpful as well. I made the cuts up as I went along and now I really wish that I had written down the order of the cuts for you! I used up all four furring strips with very little waste. If you’re good at math, you’ll be able to figure out how to make the following measurements work. The nice thing about this project is that the measurements do NOT have to be perfect. I wanted most of my boards to be different lengths to ensure the candles had room to breathe. I recommend cutting your dowel rod last after assembling and measuring exactly where to cut to ensure a perfect fit. Step 1: Create your base. 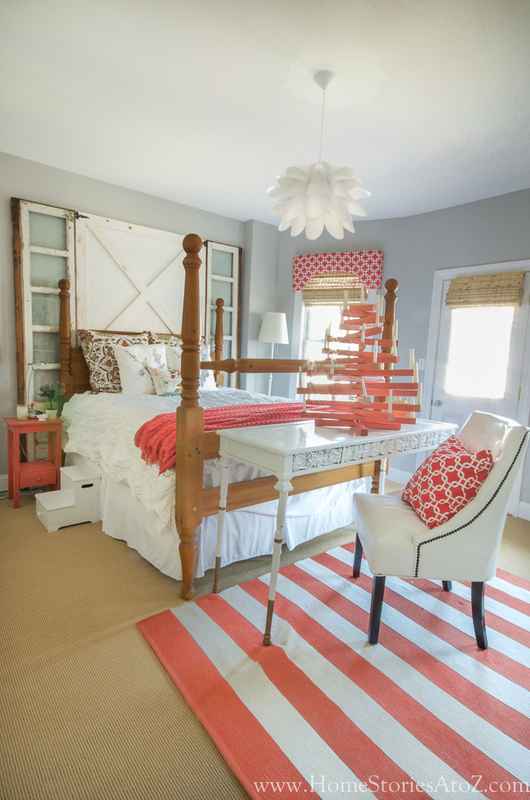 Take one of your 18″ strips and the two 8.4″ strips and create an “X” using your Kreg jig and 1 1/2″ pocket screws. Using your 3/4″ spade bit, drill a hole most of the way through your wood being careful not to drill all the way through. Place your dowel rod in the center hole. You can use wood glue to secure your dowel rod in place. I chose not to glue the dowel so that I can easily disassemble the tree at the end of the season. If you are going to light your candles frequently, I highly recommend gluing the rod in place for safety reasons. Step 2: Drill and sand your strips. Using your 3/4″ bit, drill a hole all the way through the center of each strip. Using your 13/16″ spade bit, drill most of the way down on each end of each strip. 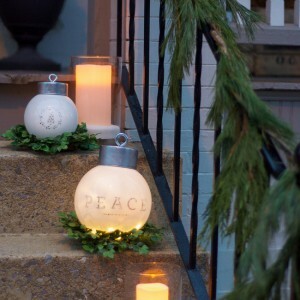 These will act as your candle holes. Sand any rough spots. 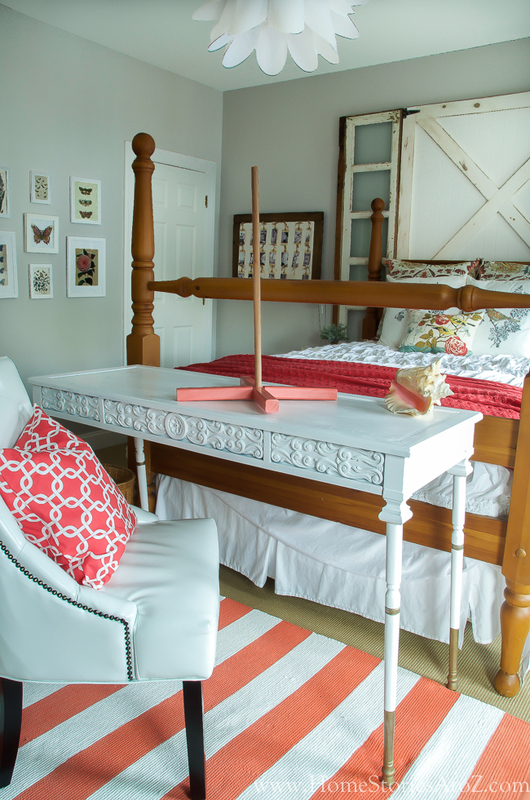 I used one can of Zinsser primer and 2 cans of Krylon Coral Isle spray paint for this project. The spray paint adds about $15 to the total cost of your project so keep that in mind. 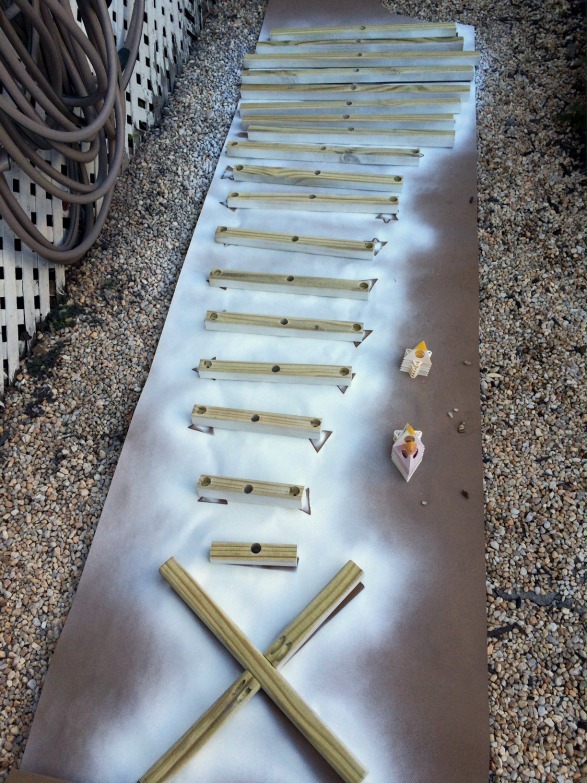 You’ll want to allow your spray paint to dry overnight or longer to ensure it is cured. Step 4: Assemble your tree. Place your strips in the following order starting with the base and dowel. Place all of your candles in the candle holes. Use mounting puddy or tinfoil to secure any loose candles. Enjoy! 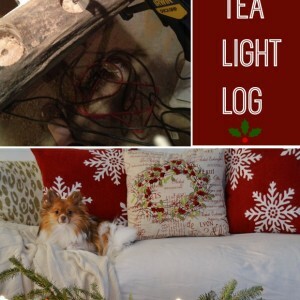 You will definitely want to check out the free Lowes Creative ideas magazine and app this month. 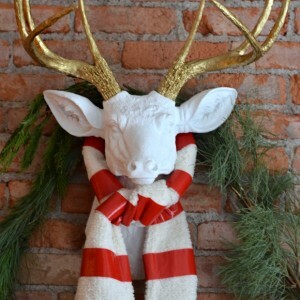 There are some fantastic DIY project ideas for the holidays! Click the badge below to sign up for the magazine. 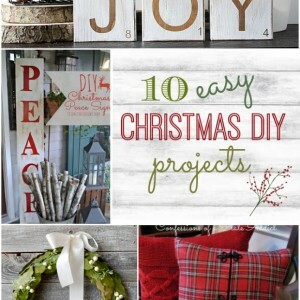 You might also like some of my other DIY Christmas ideas below!